After you die a few times, Resident Evil 2 will ask if you want to play the “assisted” mode. It adds aim-assist, weakens the enemies, and gives the protagonists some minor health regeneration. It’s totally valid to play in this mode, but I suggest playing it on the normal difficulty. Part of the fun of Resident Evil games is having to really struggle for survival. 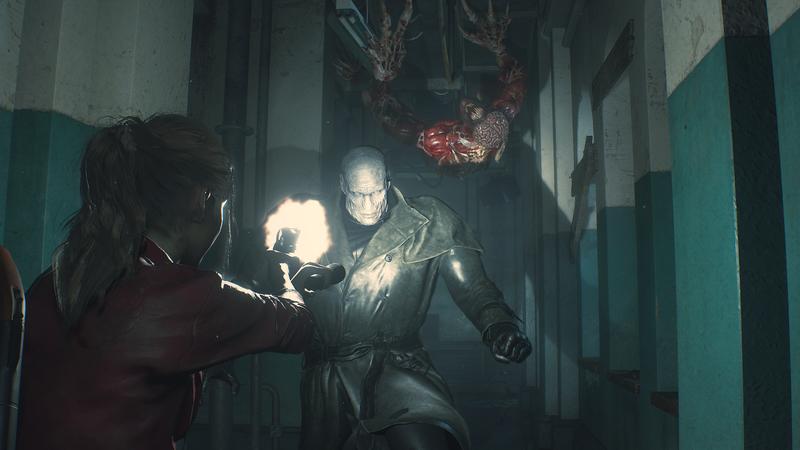 Resident Evil 2’s revamped controls already give players a huge leg up on zombies. Stick with the normal mode and summon up some courage. You’ll do just fine. Resident Evil 2 is a dark game, but that darkness is key to the atmosphere and horror. If you’re having a lot of trouble seeing or are really, really nervous, it’s okay to turn up the brightness but I suggest leaving it alone if you can manage it. You can play as either rookie cop Leon Kennedy or tough-as-nails college student Claire Redfield when you start a new game. Claire and Leon have access to different weapons and some different story moments, but neither of them is the “right” choice for your first playthrough. Pick your poison and enjoy the ride! Unlike old-school Resident Evil games, you don’t need ink ribbons to save your game if you’re playing on the normal difficulty. If you find yourself needing to take a break or even if you’ve just snagged a new item don’t be afraid to save. It seems to affect your end of game ranking, but you shouldn’t worry about that on your first playthrough anyway. There’s some checkpointing throughout the game, but it’s better to be safe than sorry. I don’t care if that room has tons of zombies in it, you need to go in there and check out every corner. Open every door, check all the lockers you find, and make sure to take in your surroundings deeply. You’ll find ammo, crafting materials, and even safe combinations. Resident Evil 2 has a lot packed into a relatively small game; be sure to look around. The map isn’t simply good at helping you find a specific room. It’s also good for knowing what else you need to explore. Red rooms still have items in them. If you’re looking for a key or unsure of where to go next, try heading for rooms you haven’t cleared. You’ll find gunpowder throughout Raccoon City, which you can combine to make bullets and other types of ammo. It’s tempting to stockpile this for when you “need” it or want to make special ammo. But the truth is that Resident Evil 2 is so generous with these materials that you’re better using them as you progress and having ammo right away. Even if you’re twitchy, you’ll have tons of bullets and even grenade launcher ammo by the end. Even if it looks like garbage, it isn’t. If you have the inventory room, take it. If you don’t know what to do with it, store it in an item box and use it when you do. More than most games in the series, Resident Evil 2 likes to hide items within items. If you find a book, go into your menu and open it. That badge you found? There’s a button on the back that totally changes what it does. Examine everything you find to make sure you’re not missing a puzzle solution or key item. Some keys and special items are useless once they’ve unlocked all their corresponding doors. If you look in your inventory and see a red X over the item, select it and choose “discard.” You’ll free up coveted inventory space that you can use for ammo and other goodies. Herbs can be combined for a variety of useful effect. The most standard combination is Green+Red, which creates a mixture that will heal you to full health. You can also combine Blue with Red to get rid of poison and gain temporary resistance to status effects. If you combine all three colors, you’ll gain a bonus to defense. Know your combinations and use them wisely to heal quickly or prepare for boss fights. While puzzles change on your second character’s playthrough, safe combos stay the same. Write it down somewhere and use it later to save yourself some hassle. They might be able to take a beating but you actually have a lot of ways to deal with zombies. Shooting them in the head (multiple times) can put them down quickly, but if you don’t have the ammo you can also shoot or knife them in the kneecap and run past them when they fall. Even if you’ve seriously messed up a zombie before, they might still get up for another round. Unless you manage to blow a zombie’s head off, there’s a chance that they’ll get up again even after you’ve “killed” them. Defeating them enough times will stop them from reviving but you should always be way of corpses to avoid getting caught off guard. This changes depending on your console but if you press down and B on the Xbox One or down and O on the Playstation 4, you’ll do a quick turn. It’s good for getting away from zombies, and you should get comfortable using it. Knives are incredibly useful, and you should always carry one. Not only can they be used to escape an enemy’s clutches, you can slash at zombies when they fall to do extra damage. For extra effect, slash their arms. You can cut them right off, preventing them from grabbing you in the future. Eventually, you’ll find zombies infested with mutant plantlife. You can temporarily dispatch them by shooting weak points but if you have the flamethrower or incendiary grenades for your launcher, you can burn them to a crisp to keep them from getting up. If they’re black and shriveled, it means they’re down for the count. Unless you’re caught in a dead end, there’s no need to waste ammo on Mr. X, the massive and mostly invincible Tyrant that stalks you throughout the game. If you’re in a tight spot, try to bait a punch of out him and dodge around. Run away and, once you’ve lost him, go back to wherever you need to be. After you complete the game with one character, you unlock a “2nd” story route for the other. You need to play this in order to get the real ending. The second story hits all of a character’s plot beats but revamps some of the puzzles and enemy placement for a sort of ROM hacked experience. This is what you want to play if you want to actually finish the story. Resident Evil 2 is a tense game and it can be easy to panic. Take a breath and try not to worry. The worst that happens is you see a Game Over screen and start up again. If you’re not into horror, professional music-liker Kirk Hamilton made some tips specifically for you that might help. They’re for RE7 but apply here as well. Otherwise, try to keep a cool head and take breaks from time to time. Eventually, you’ll cruise through Raccoon City like a pro. This is a game! Enjoy the all the twists and turns, and try not to get angry if you make a mistake. Resident Evil 2 is a fun ride, made all the better with a positive mindset. You’re gonna do great.